Archaeologists have uncovered a treasure trove of historical artifacts in the ancient city of Heracleion, but these items were not found buried underground. Instead, they were resting beneath the surface of the Mediterranean Sea. If there's one universal constant we can always rely on, it's that nature doesn't really care about humanity. Sure, we could destroy the ozone layer or nuke the planet to irradiated scrap, but after a few hundred years the world will have continued on without us, gradually erasing all traces that humans ever walked the earth. 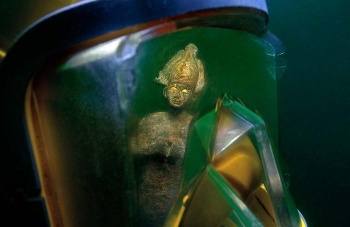 Case in point: The sunken city of Heracleion. At the height of Egypt's power, scientists believe that Heracleion (or "Thonis," as the Egyptians called it) served as a port of major importance, situated as it was at the intersection of the Mediterranean and the Nile River. This is supported by the "64 ancient shipwrecks and more than 700 anchors" that archaeologists have recovered from Aboukir Bay, an area that served as the location of Hercleion before the city was buried under a gradual torrent of water, mud and sand. Despite its impressive past, Heracleion currently lies 30 feet below the surface of the Bay. While the city's current resting place may not be very hospitable to visitors, researchers love that the place sunk into the Sea. "The archaeological evidence is simply overwhelming," states Oxford professor Sir Barry Cunliffe. "By lying untouched and protected by sand on the sea floor for centuries they are brilliantly preserved." Scientists have been excavating Heracleion since 2000, and in that time they've uncovered a wealth of religious artifacts (including massive limestone statuary), the aforementioned shipwrecks and a number of other objects which offer a glimpse into the city's mysterious past. So why exactly did Heracleion sink? That's the big mystery here. Some researchers suggest that the weight of the city's buildings, combined with the relatively sandy soil on which the place was built could have served as a perfect recipe for the creation of a sinkhole large enough to swallow Heracleion, particularly following a major geological event like an earthquake. Despite 13 years of digging, archaeologists feel they still have a long ways to go before they've plumbed all of Heracleion's secrets. ""We are just at the beginning of our research," says Franck Goddio, one of the first people to discover Heracleion, "we will probably have to continue working for the next 200 years for Thonis-Heracleion to be fully revealed and understood."